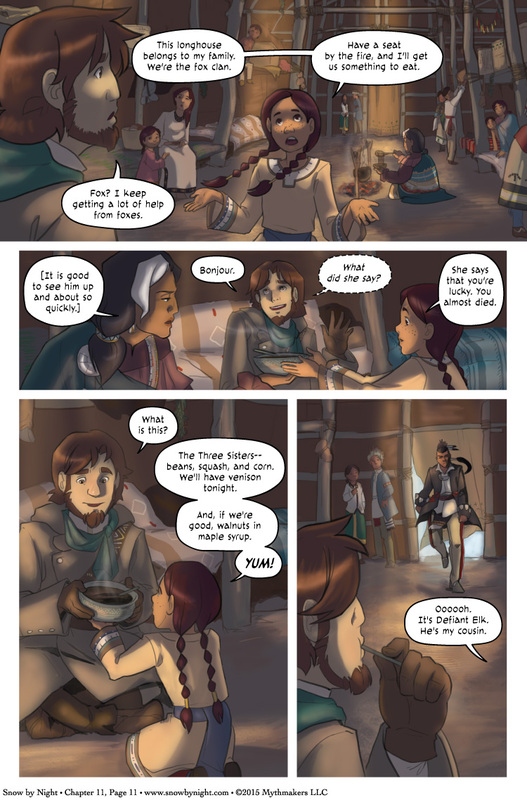 Toothy Kit introduces Blaise to her family — the Fox Clan on Chapter 11 Page 11. Clans are the family unit among the Liranequois and they are all determined matrilineally. This is why Toothy Kit is a member of the clan regardless of her father’s nationality. The Fox Clan is an invention of mine for the purposes of this comic. There is no Fox clan among the Haudenosaunee (aka, the Iroquois). I’ll be discussing the clans more in depth in a future Almanac entry. To see Defiant Elk’s greeting to Blaise, please vote for Snow by Night on Top Web Comics. I’m going off on a family vacation starting Tuesday. Diane will be handling the updates for the next couple of weeks. Volume 2 books should arrive while I’m gone. I’ll start shipping those out to the Kickstarter backers as soon as I get back. Ah, Three Sisters stew. An excellent autumnal meal even when it’s not your dietary staple. My mom hit on it once as my vegetarian option for Thanksgiving. Can’t help feeling some expression of gratitude from M. Dansereau would be appropriate about now. If not ‘thanks for saving my life’ at least ‘thanks for the stew’. Still, the fact that this hasn’t occurred to him yet is completely in character.